Medical Clinic Helotes (Helotes) - Book Appointment Online! 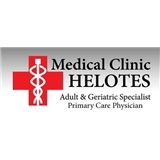 Helotes Medical Clinic is a comprehensive primary care practice specializing in the diagnosis and treatment of adult and geriatric related disorders. We offer our patients a highly trained and licensed staff with experience in Internal Medicine, Geriatric Medicine, Hospice Care, and Palliative Care. Our physician staff is comprised of board certified physicians trained and licensed in Texas to deal with all aspects of Adult and Geriatric Medicine. Our practice is based in San Antonio, Texas in a newly renovated office space in the Northwest side of town. We offer our patients on-site diagnostic equipment without the need of additional costly physician visits to quickly gather important clinical data to help better treat our patients. Locally we serve Christus Santa Rosa Northwest, St Lukes Baptist, and Southwest Methodist hospitals in addition to our clinic outpatients. He’s really great! It’s such a plus that he speaks Spanish! I would highly recommend NP Broom. She was very personable and seemed genuinely concerned with my wellness. I’ll be back!